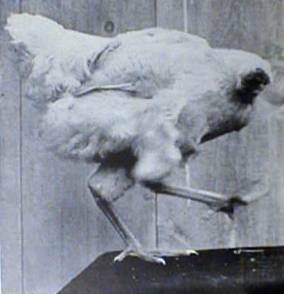 Mike the Headless Chicken is one of the freakiest animals that has ever lived. Mike was a Wyandotte chicken who survived for 18 months after his head had been mostly cut off by farmer Lloyd Olsen as he was slaughtering him for dinner. Olsen missed the jugular vein, leaving one ear and most of the brain stem intact. When Olsen realized that the bird had survived, he decided to care for him permanently — feeding him a mixture of milk and water via an eyedropper. Although initially thought to be a hoax, the bird was taken to the University of Utah to establish its authenticity.